Remember when you got your first PC and spent hours exploring everything it could do? I’m talking about the programs – nowadays referred to as Apps – such as Paint or Encarta, or the games like Solitaire, Pinball or Minesweeper. 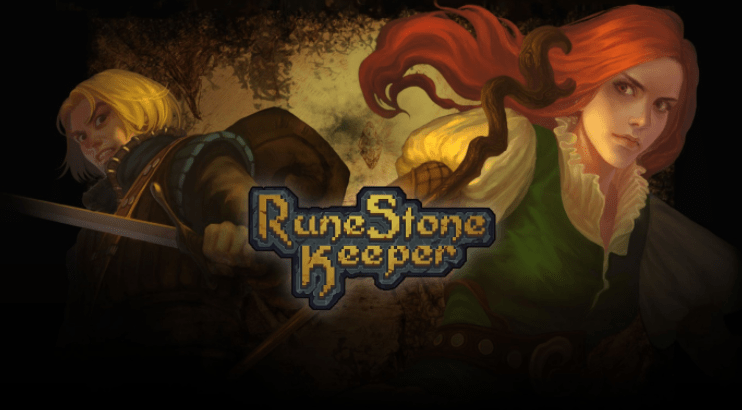 If your heart just swelled up with memories of Minesweeper and wasting away hours on it then well my friend, come with me as I introduce you to Runestone Keeper, the distant cousin to Minesweeper that the family don’t really want you hanging around with. That’s how best to describe Runestone Keeper, as a Minesweeper clone, but offering a hell of a lot more in terms of RPG mechanics. Think of it as that but pair it with the classic adventure board games such as Heroquest – a personal favourite – where tiles are revealed as you progress, and the premise becomes a lot simpler to understand than screenshots would suggest. There is still a lot ‘under the hood’ with this game though, far more depth in its mechanics than simply choosing the correct square. As a game though, it’s lacking almost anything else. 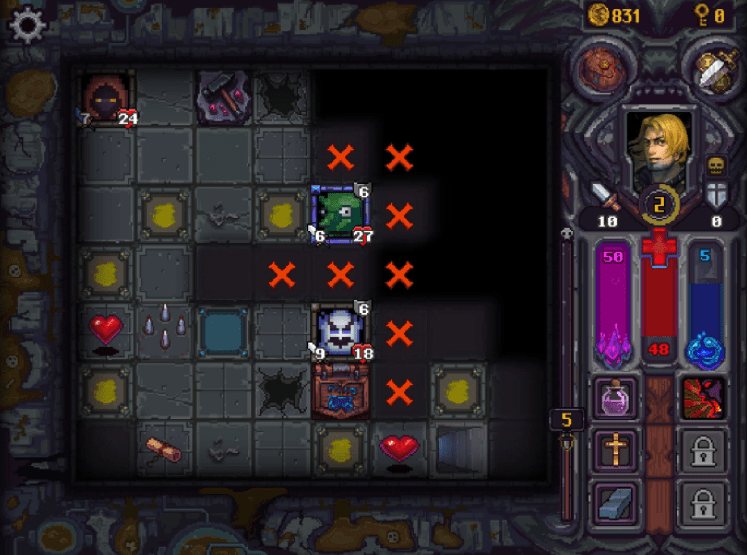 At its core, Runestone Keeper is a roguelike dungeon crawler, where the player must pass through room after room of procedurally-generated areas. These will keep repeating until the player manages to escape, dies at the hands of the many monsters lurking, or falls victim to the deadly traps they uncover by choosing the wrong square. Fall at the hands of the dungeon and it’s game over for that character, requiring the player to start all over again with nothing. Make it back to the floor you perished on last time and you can retrieve your items, but this in itself is a challenge in a very challenging game. Whilst selecting a blank square or the exit square is the ideal goal – these are few and far between, especially in later levels – you also need to level up your character by defeating the monsters in the dungeon. Do so, and you are awarded EXP; earn enough and you can level up. On the Normal setting – known in RK as Nightmare – monsters level up a lot faster than you can and before long you will be dodging most encounters just to make it to the next floor. However, some floors have keys hidden within that can only be dropped by the monsters. And to make things trickier, any monster that is uncovered generates an area around them that cannot be explored until they are defeated. Chances are, the stairs leading out of this floor of the dungeon are hidden behind these areas. The action is turn based when you do decide to fight a monster, but half the battle is also knowing which monster to fight and at what time. For example, nearly all have unique traits that you can check by pressing the Y button when your cursor is over one of them; some dish out buffs to other monsters so it makes sense to take them out first. Others have a timer by which they explode after three turns. My favourite though is the monster that rather than takes damage, gives it to others for double damage. It always makes sense to attack this one first when in a room full of them, as your puny attacks wont do enough damage without this trait. 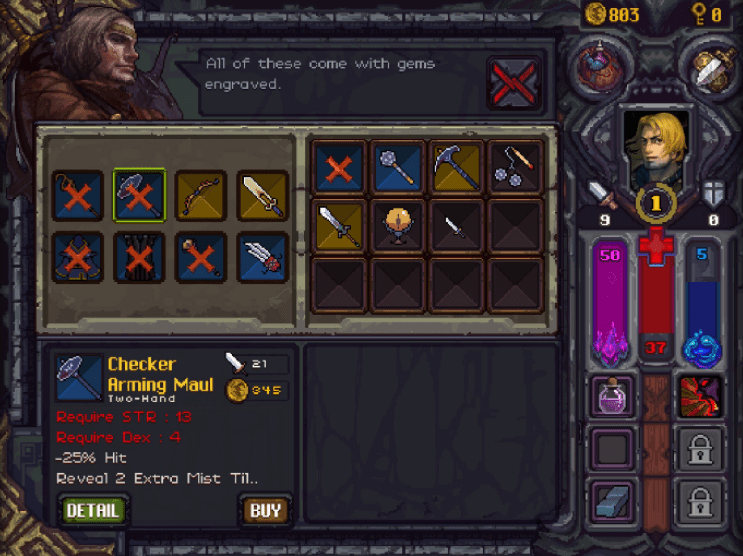 In regards of that cursor, on more than a couple of occasions Runestone Keeper has requested me to ‘right click’ on things to bring up information. It seems like the conversion to Xbox One from PC is not yet fully complete. Some things do carry over between deaths thankfully. The titular Runestones that can be found, bought, crafted, swapped and traded all carry over. Every so often as well, the player will encounter altars to pray at. Some offer HP and Mana in exchange for Soul points – the currency you generate from exploring the dungeon – but other altars are for specific Gods to encounter in the game. Pray to one of these during a playthrough and it becomes unlockable in the game start screen next time. For a small fee of Gold at least; a good job then that your Gold carries over too. Like any standard permadeath game, you can feel yourself becoming stronger and better as things go on. But with Runestone Keeper, I also feel that after countless runs, I am still way under powered to actually get far enough into the action. It could be that I am bad at this game, but looking at various stats for other players, and most other people appear to be having the same trouble. To top things off, one time upon loading, I noticed my Gold counter had reset to 100 and the Gods I had unlocked had disappeared. My ‘progress’ had been wiped completely, and with the lack of rewards this game dishes out, it’s a struggle to be willing to put the hours back in. This difficulty extends to the Achievements as well. During my time with Runestone Keeper I didn’t unlock a single one, failing to get past floor 8 in any of my playthroughs. Many of the 20 achievements are for completing the game under various conditions, or fully upgrading aspects of your character. This is a seriously punishing game that will easily run out of steam before you collect all the Achievements. Despite how it sounds, RK can be a calming experience. It gives you time to plan ahead, what with it being turn based, and the music is surprisingly soothing despite the dungeon setting. A game to play when winding down, the unintentional frustrations remain, but you can at least see the way that it was meant to be heading. And that’s pretty much it for Runestone Keeper. It’s a novel game for the first few tries, but its slow drip feed of progress prevents you from getting anywhere near the end, failing to really entice you to return after logging out. The icing on the cake being that my own progress was wiped completely, and I couldn’t work out why. It has deep RPG mechanics and I very much enjoyed that aspect of figuring out battle plans and strategies, but it is lacking almost everywhere else. A local co-op mode would have worked well in this game, heck even a story mode wouldn’t have gone a miss. 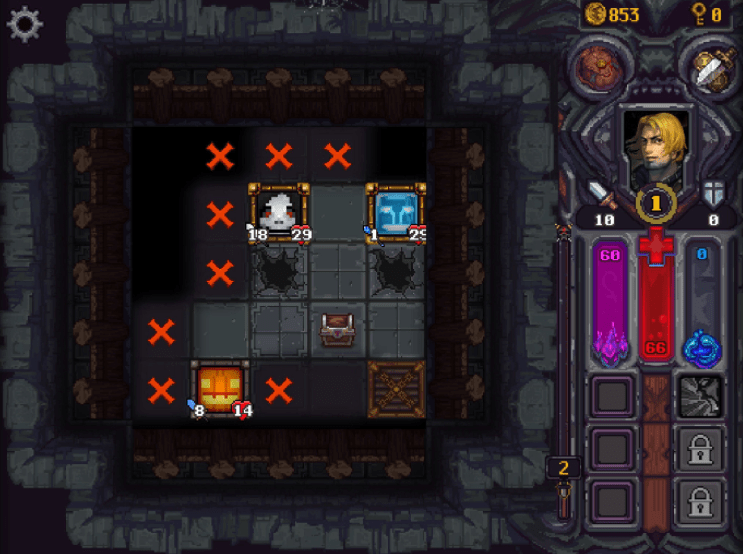 As it is, Runestone Keeper has you aimlessly wandering down a dungeon, more times than not to your death. Next articlePES 2018 Data Pack 4 brings 100 new Player Face Upgrades and much more!